*IMPORTANT*: Am I trying to imply that every single alert is a big winner like these? No. Am I implying that these sorts of alerts are the reason you should always keep your losers small and cut them quickly so that you don’t “miss out” on the bigger winners? Yes, absolutely! Stock Trading Chat Room: How Are We Different? Congrats to the chatroom! $APRI killed it for us! 95% move in only 2 hours. 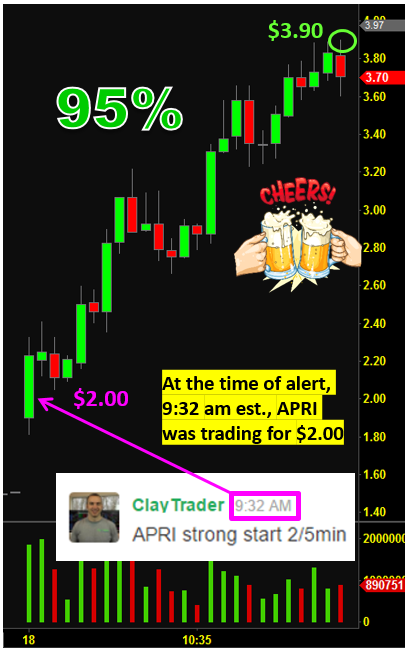 Congrats to the chat room members who played $APOP. Up 75% in 2 hrs. Our team caught it early in the morning. 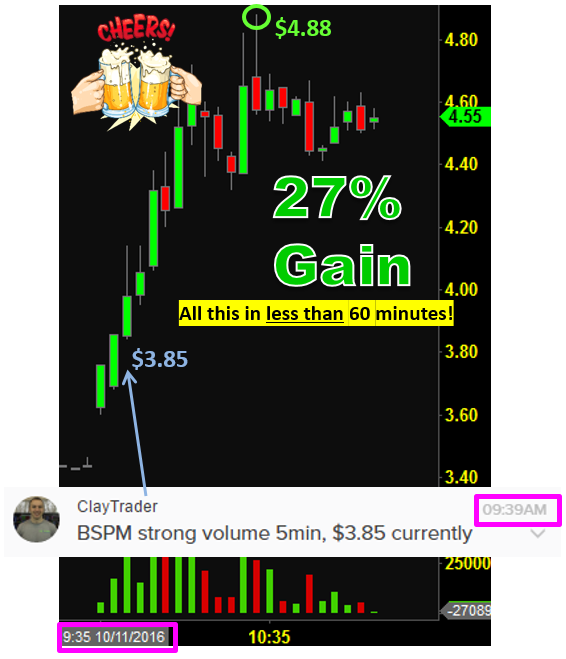 Congrats to chatroom members who took advantage of the $BSPM alert! A quick 27% move in less than an hour. Shoutout to “dtom” for the $RGSE alert at $3.60! Moved 122%! A great winner for the chatroom! 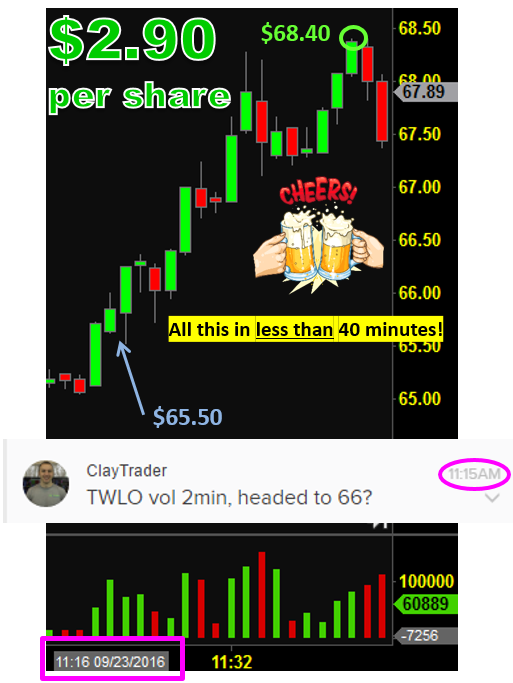 Nice end of week $TWLO trade for the chat room community! $2.90 per share in less than 45 mins. Great Friday! 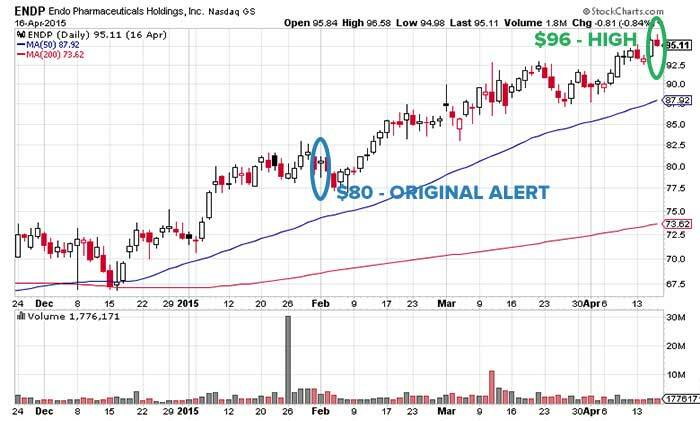 $EGLE alerted at $8. Helped pay for this member’s membership cost! 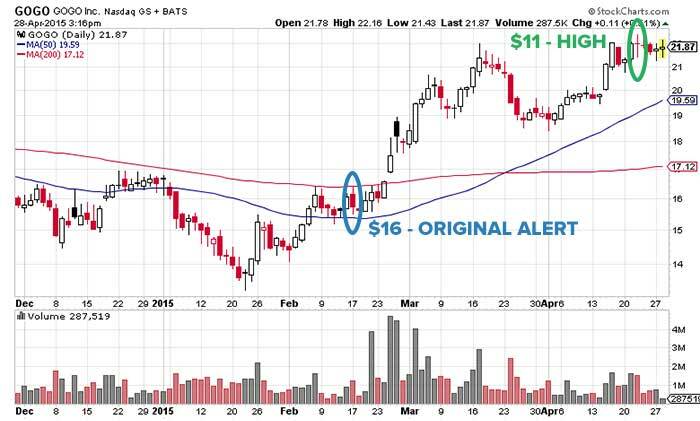 MGT was alerted based on momentum and moving averages, since the alert has gained over 260%! 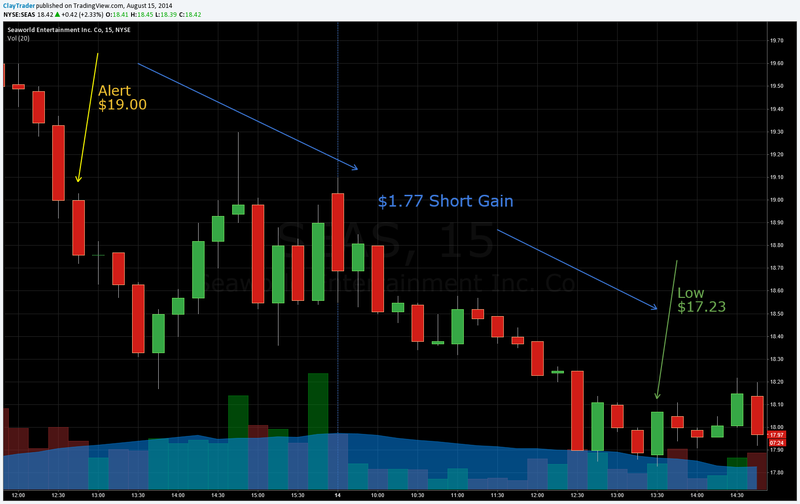 Based on a volume increase on the 2 minute chart BLPH was alerted and gained $1.54 per share. Another volume alert, this time for WGBS which gained 41% after the alert. 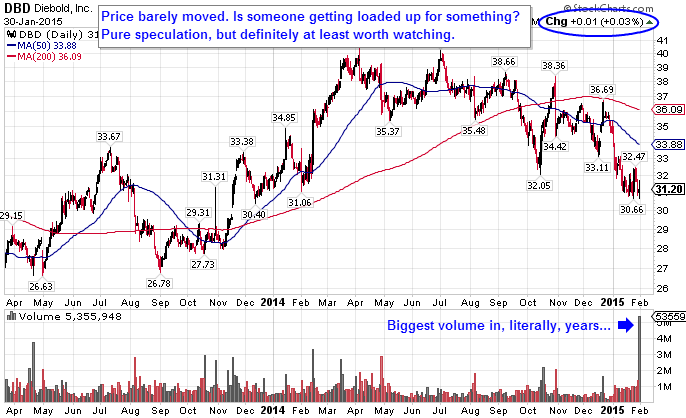 Based on a volume surge FIT was alerted and gained $2.12 per share. WTW was alerted based on a volume spike and gained almost 11% from the alert. 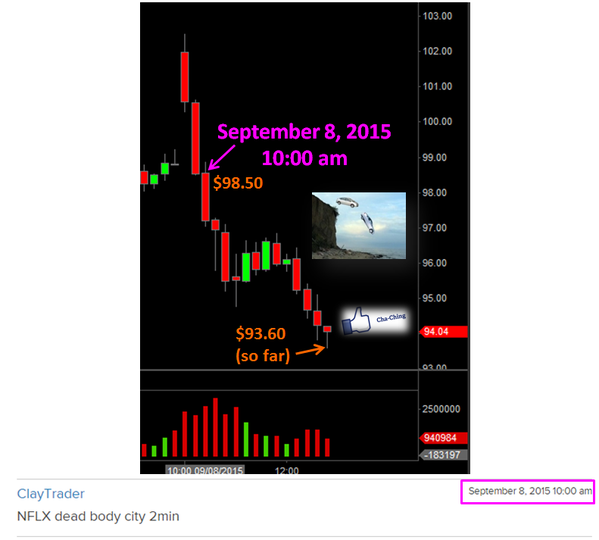 NFLX was alerted on a massive downwards move. Dropped from $98.50 to as low a $93.60. Alerted based on a volume spike, AQXP rose 160%. Based on news DNRG was alerted on June 24 pre market. After the alert the stock rose 2150%. 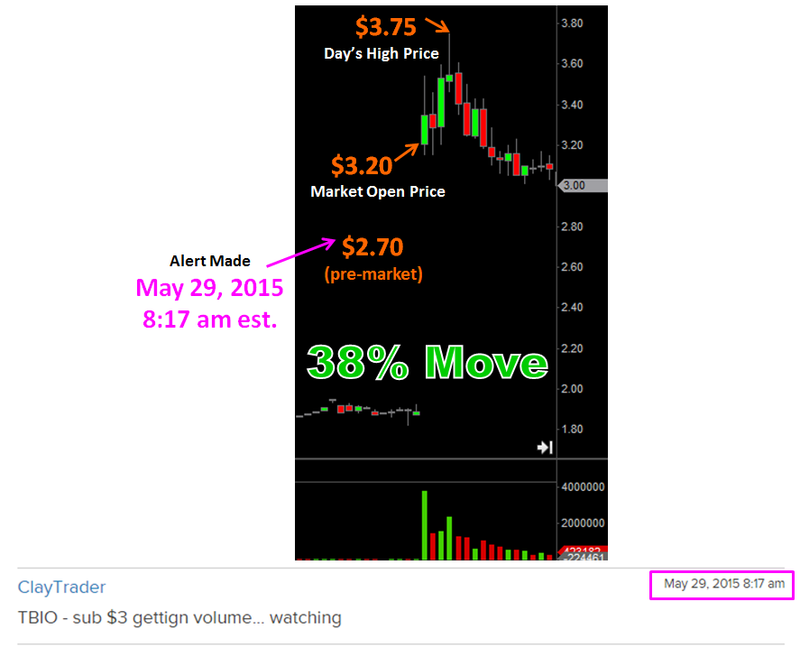 TBIO was alerted premarket in the chat room as it was gaining volume momentum. From open to the days high there was a 38% opportunity window. Pre market MYEC was alerted as there was a reduction in shares after the previous day close. 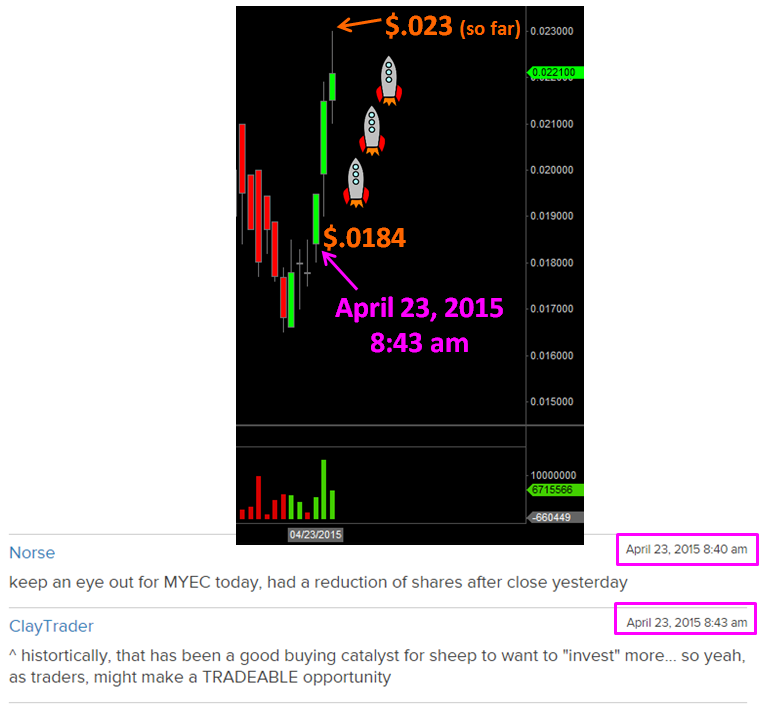 MYEC opened at $.0184 and ran as high as $.023. 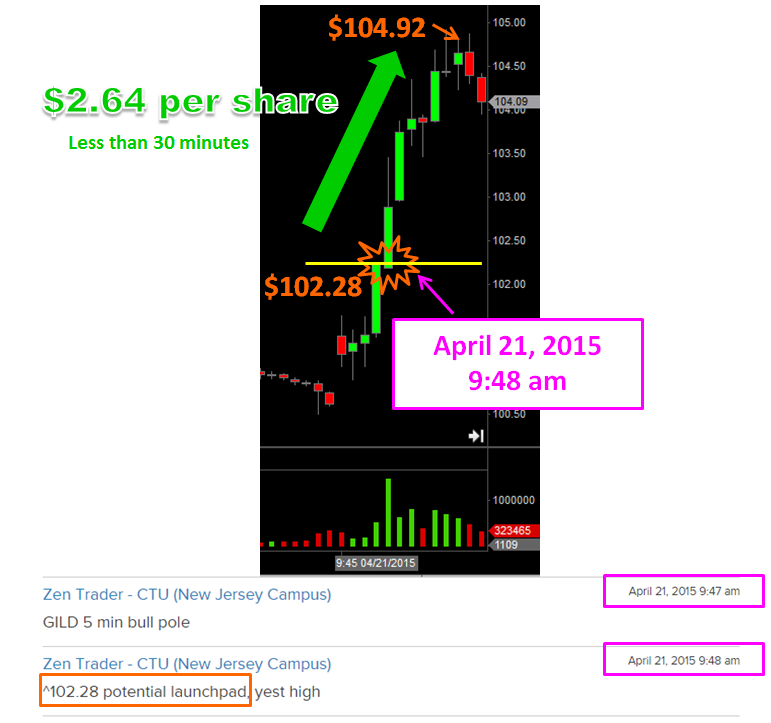 GILD was alerted based on a bull pole on the 5 minute chart on April 21. 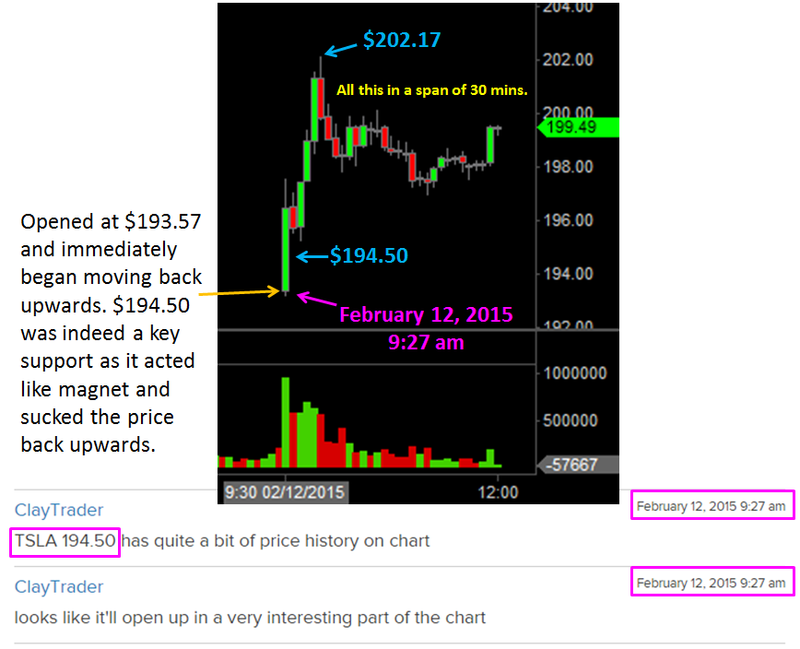 The alert happened while trading action was at $102.28 and ran all the way up to $104.92. 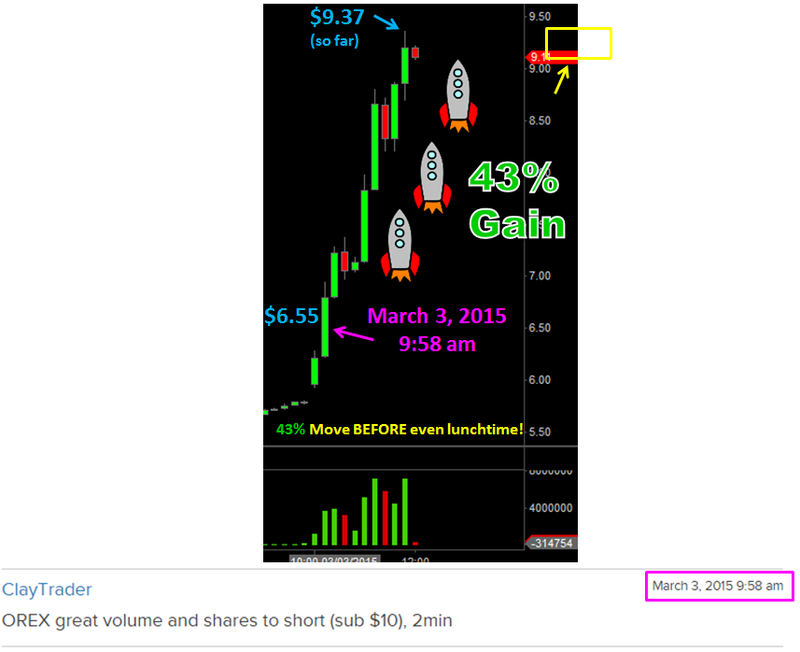 WUBA had a $10 gain from an Inner Circle alert based on volume and price movement. 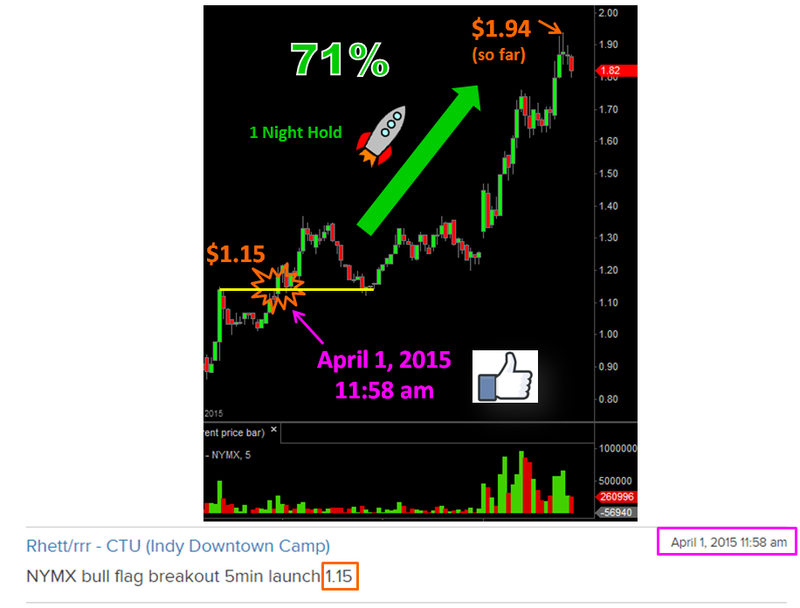 After a 1 night hold NYMX was up 71% based on a bull flag breakout alert on the 5 minute chart. 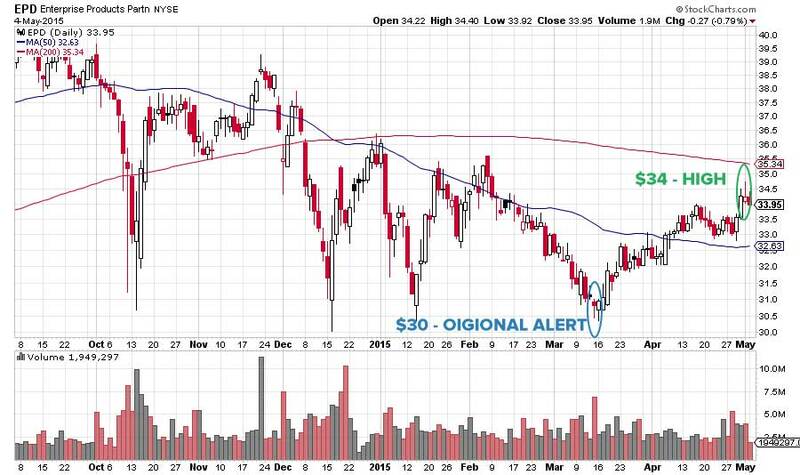 TWTR was alerted based on a large volume increase on the 2 minute chart for a potential gain of $2.09 per share. ESPR gained over $32 per share based on an alert in the chat room. 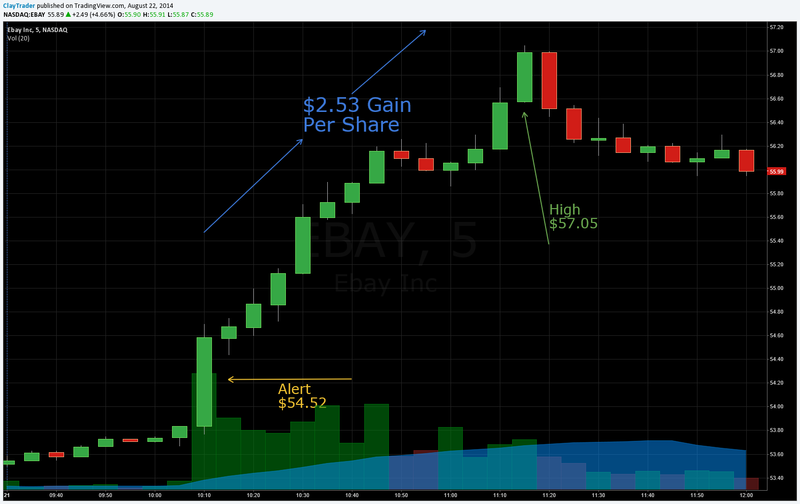 BABA was overdone on the 2 and 5 minute charts. A huge volume increase on the 1 minute chart caused the alert for PPCH. 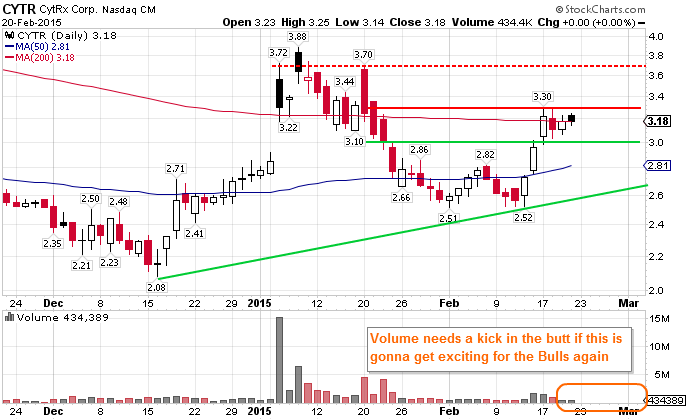 OREX great volume and shares to short (sub $10), 2 minute chart. 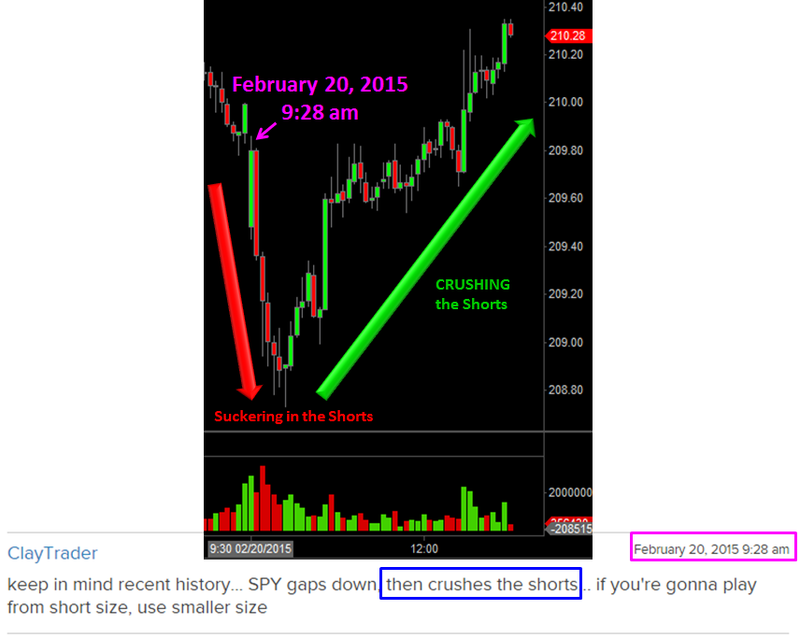 Keep in mind recent history… SPY gaps down, then crushes the shorts… if you’re gonna play from short side, use smaller size. 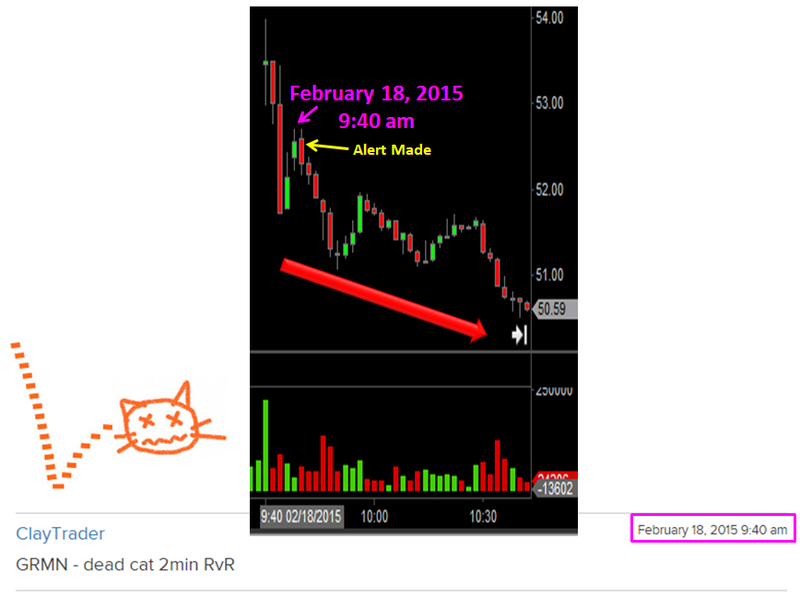 Based on the 2 minute chart GRMN was alerted as a dead cat. A rising wedge pattern was alerted on the 5 minute chart suggesting a possibly dump around the corner. TSLA opened at $193.57 and immediately began moving back upwards. $194.50 was indeed a key support as it acted like a magnet and sucked the price back upwards. Teamwork at its best. I was having one massive headache of a day until the team member made and excellent alert in the chat room which gave me a quick boost. 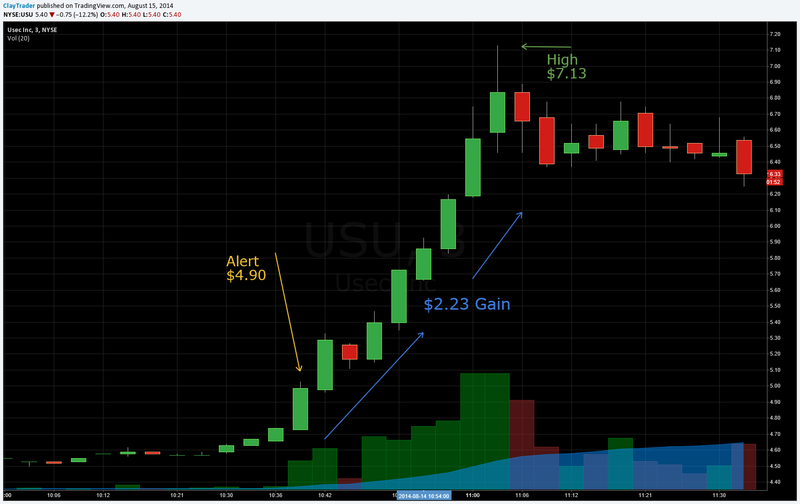 UNIS was alerted based on a volume spike and a CNBC mention. 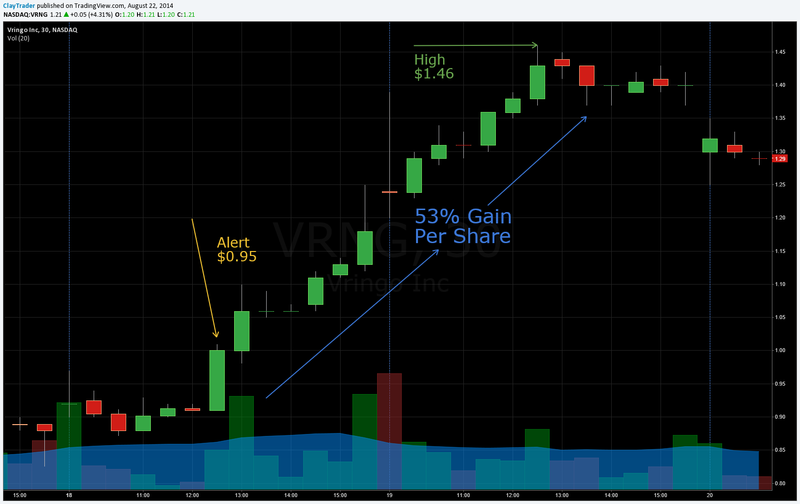 An RvR play was alerted based on the 5 minute chart for KORS. Either there was going to be a nice bounce with a lot of potential upside or there would be a small loss if played correctly with a stop loss in place. The bounce is exactly what happened. 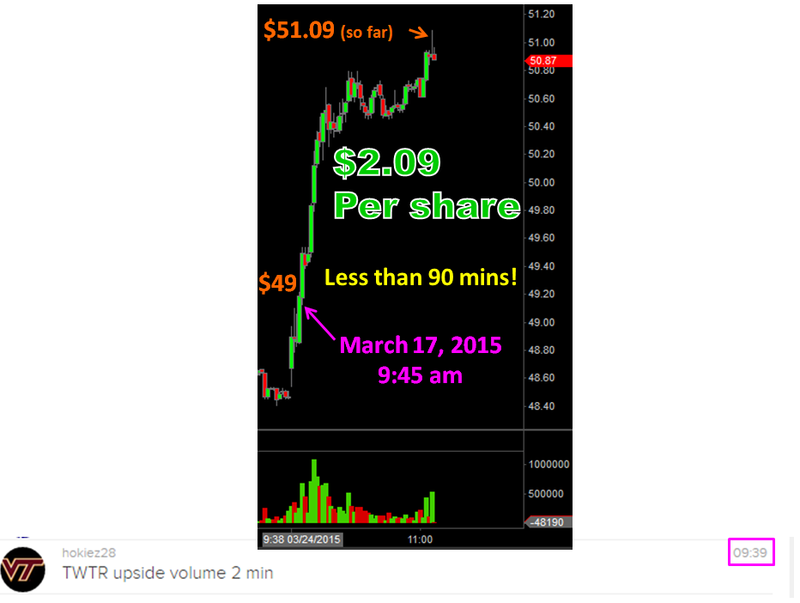 Alerted at $67.50 KORS ran to $69.42 and I was able to pull over $180 out of the move. 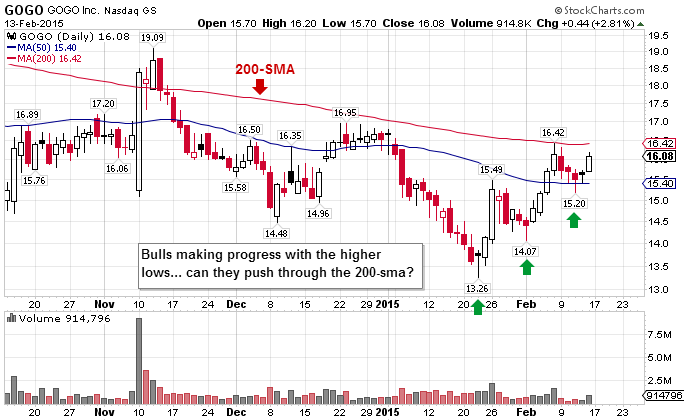 The alert came regarding a possible bounce off of the 200sma on the daily chart. The bounce came within 5 cents of the trend line hitting a low of $95.81 before topping out at $100.32. This alert made when market were down approximately 400 points. The Risk vs. Reward was at a very attractive spot, and the bounce is exactly what happened. Alerted on a massive volume spike at $39.35, INFA ran all the way to $41.18. 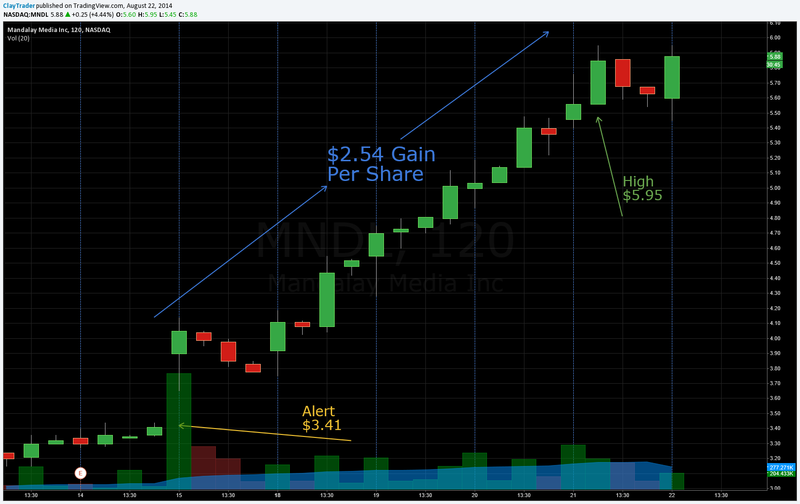 I was able to take a profit of $250 trading INFA but the profits could have been much larger. $GOOG was alerted based on the potential break of the $524.25 resistance level on the 5 minute chart. 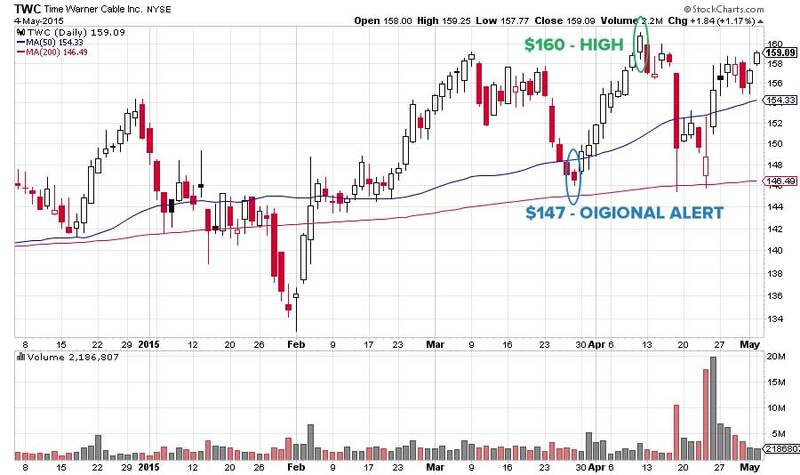 After the break of that level GOOG moved to a high of $529.98. Although this was only a 1.1% move of the stock, the option moved 114%. A member of the inner circle alerted TSLA towards the short side as a bear flag was forming on the 5 minute chart. At that point the support level was $190.25. 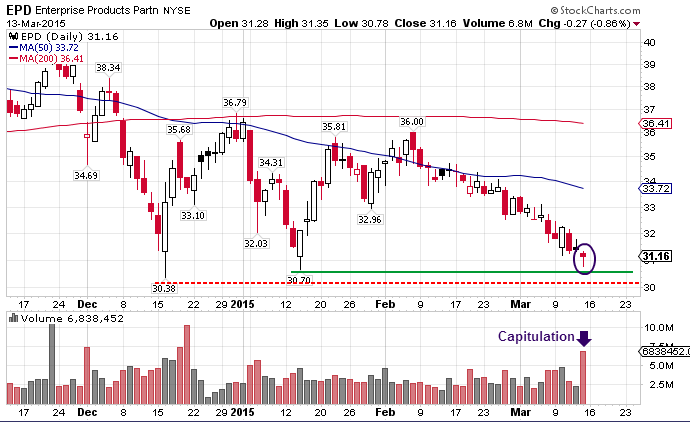 Once that support was broken TSLA crashed to $187.04 for a potential opportunity window of $3.21 per share. AAPL, alerted on the 15 min chart towards the short side while trading at $107.35. Within a couple of hours AAPL was as low as $105.20 for an opportunity window of $2.15 per share. SCTY was alerted by a member of the Inner Circle Chat Room as it was forming an Ascending Triangle on the 15 min chart. 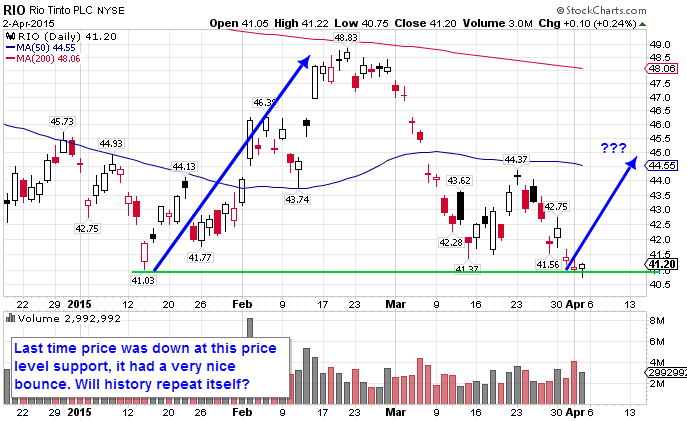 Once it broke through the key level of $48.54 SCTY took off for an opportunity windows of $3.19 per share to $51.73. 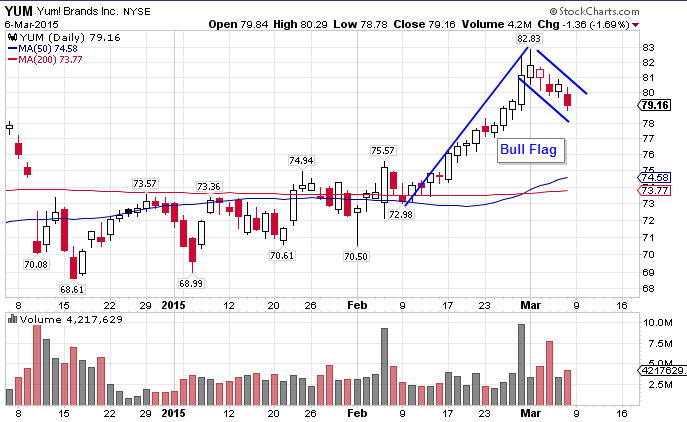 BITA was alerted towards the short side as it broke through a key support level at $77.80 on the 2 minute chart. Once that level was broken BITA fell $6.10 per share to $71.70. 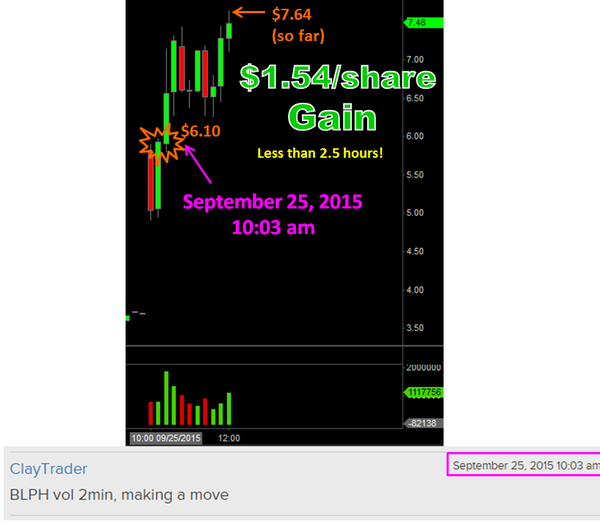 Alerted on a large volume increase, BIND moved $2.65 a share from $7.40 to $10.04 in less than 90 minutes. A large overnight gap up was alerted premarket in the chat room for NDRM. At market open NDRM was trading at $8.27 and rallied to $10.96 for an opportunity window of 33% (update: after this image was created NDRM went as high as $19.07 within the same day for a potential gain 131%). CUBA was alerted in the chat room on a large volume increase. CUBA shot up from $7.25 per share to $13.59, creating an opportunity window of $6.34 per share. 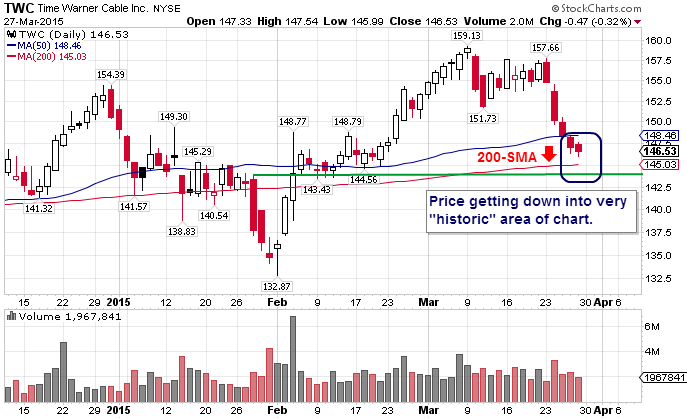 GPRO was alerted at $62.20 as a key support area. 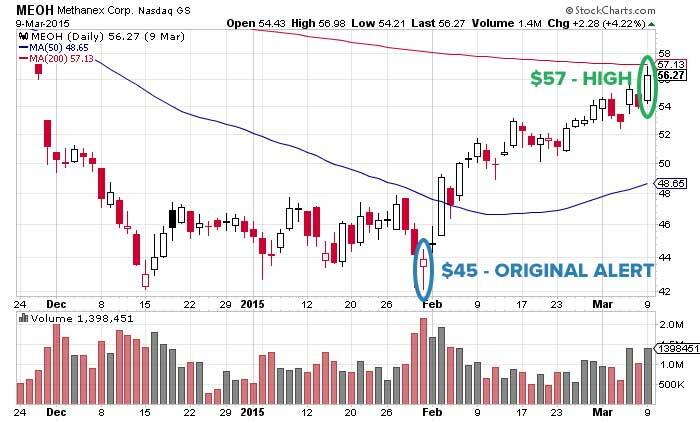 If trading options the buy it would have been $1.40 per option at the time of alert. After the collapse that ended with GPRO down to $58.68 is less than an hour the put options were now valued at $3.90, allowing for a 179% opportunity window. RADA had a large spike in volume on the 5 minute chart based on news. In less than 1 day RADA rallied from $2.80 per share to $3.86, for an opportunity windows of 38%. “I smell a dead cat bounce” was the alert that came in the chat room during pre-market discussion. After the opening bell it had a great day, which was followed by a gap-up the next day… eventually peaking for an opportunity window of 170%. 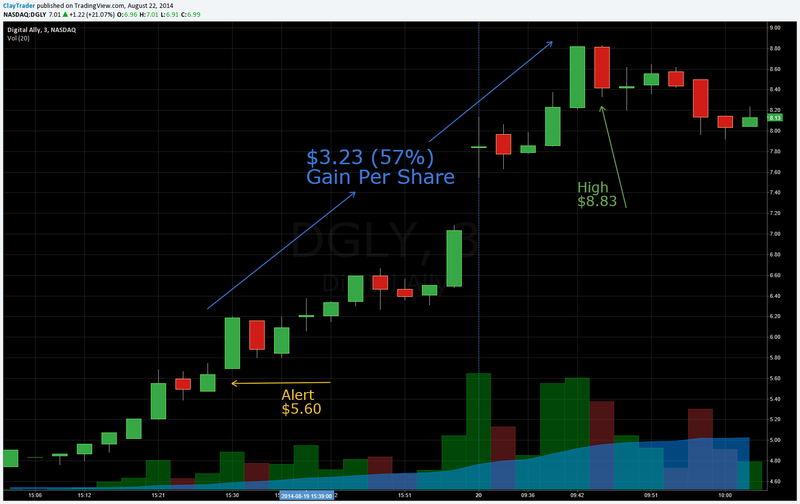 DGLY was alerted based on a spike in volume on the 2 minute chart. 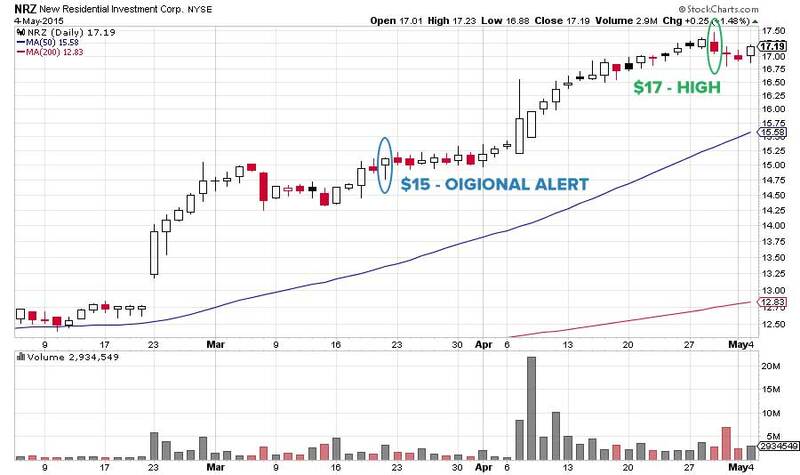 Within about 90 minutes an opportunity window of $3.50 per share was created when the stock jumped from $15.35 at the time of the alert to $18.85. Alerted on a possible Dead Cat Bounce in the 2 minute chart, GILD fell $3.24 per share in about 22 minutes from $103.40 to $100.16. Starting off the week we had an alert for $AEMD. It was a two fold alert as the price broke though the previous resistance point and also had news. The break was at $0.29 and $AEMD topped out at $0.40 for a 43% opportunity window. 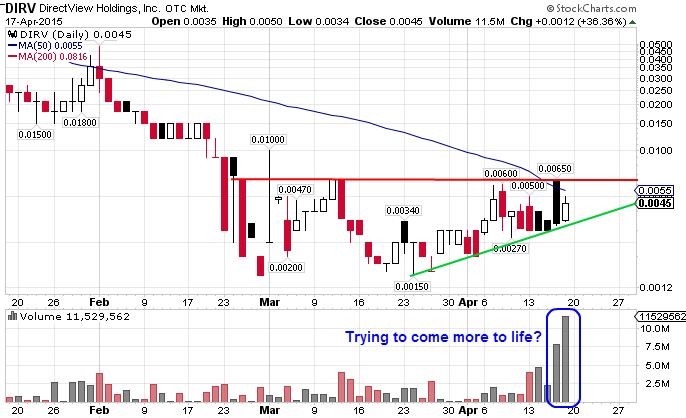 Finally this week we have $MINE. 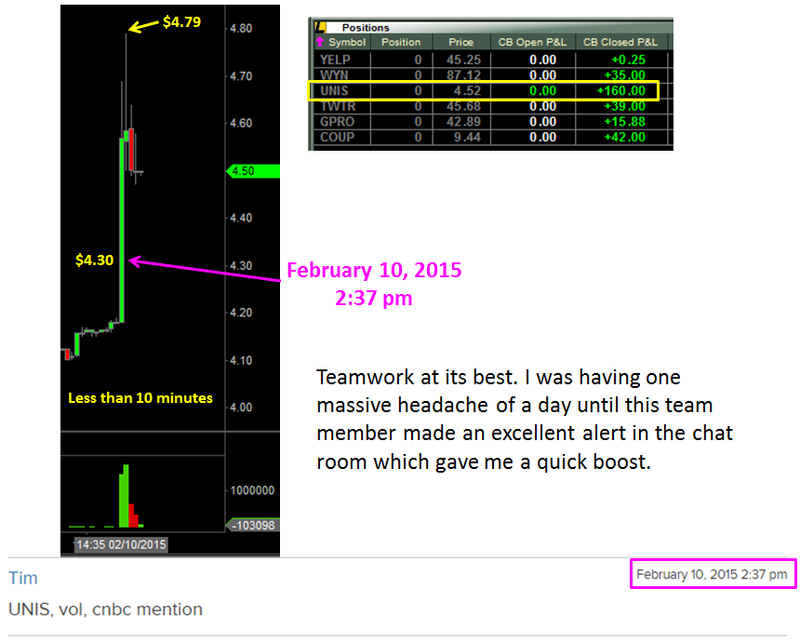 After having a “crazy day” it was alerted at $0.0031 and rose 55% to $0.0048 a few days later. A penny stock is our first alert this week. DEWM was alerted based on the resistance level on the 2 Min chart as well as a volume spike. 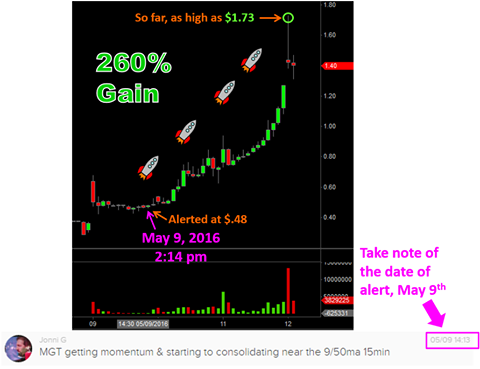 Being alerted at $0.0019 and hitting a high of $0.0045 means there was an opportunity window of 137%. $DEWM has been very good to the penny stock swing traders in the group. At the point of this image, the price was testing the $0.0054. 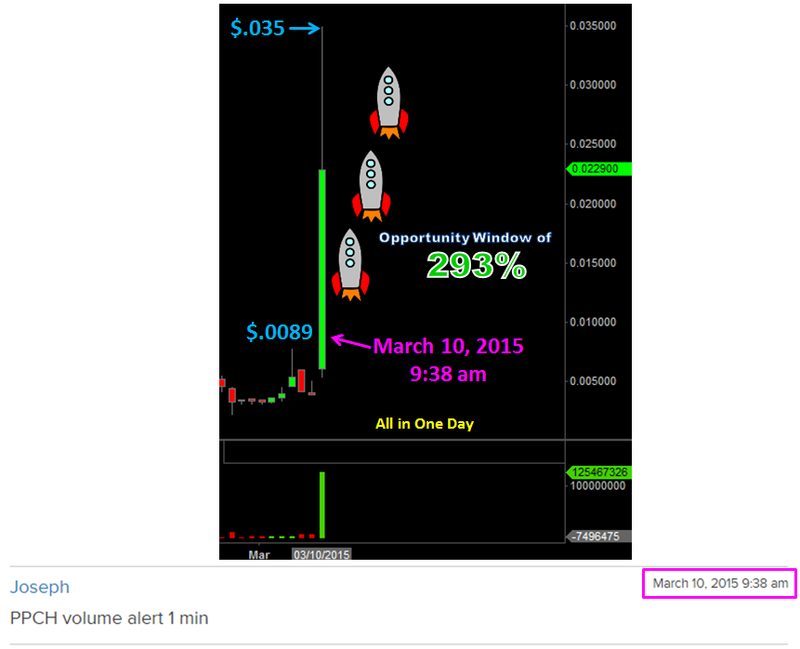 Given the original alert was issued at $.0019, the opportunity window for $DEWM reached over 180%. GOGO had a run based on news from AT&T. 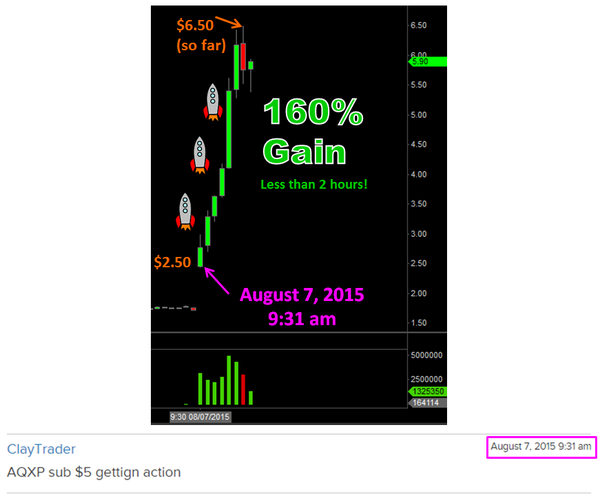 The alert came in the chat room while trading was at $16.15. 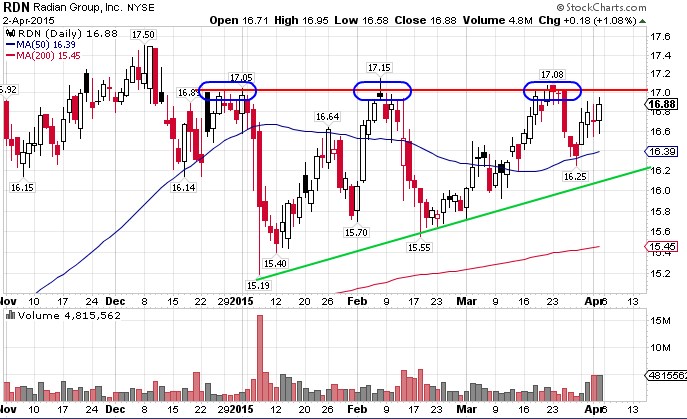 Over the next couple of days, swing traders eventually saw it hitting a high of $19.09. 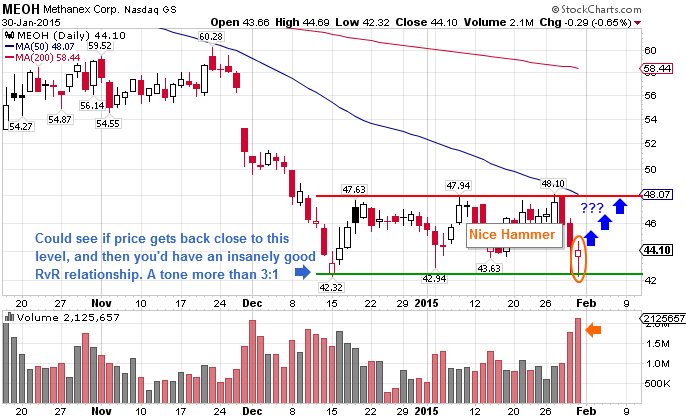 $ISIS was originally alerted at $44.60 in the weekend Power Profit Scan newsletter. It then went on to hit over $53 per share. Check out the original alert chart below. 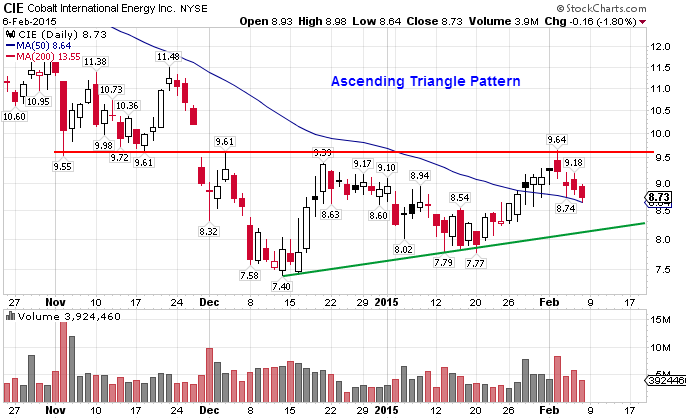 PLNR broke the downtrend at $6.35 on the 5 minute chart. 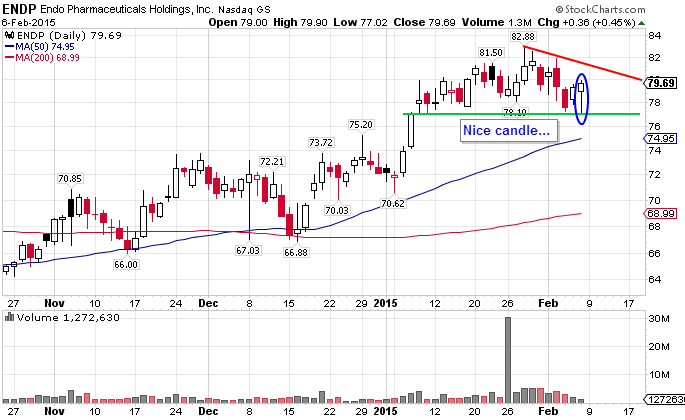 From there it broke out to the high side at $7.18 for $.83 per share. The alert for $NSM came in a little late at $29.35 but still left a bit of a shorting opportunity for $1.80 per share over a small period of time. This is a great example of how you don’t always need to be around right at the start of the original move. All you have to do is follow the chart and it serves as a great guide. 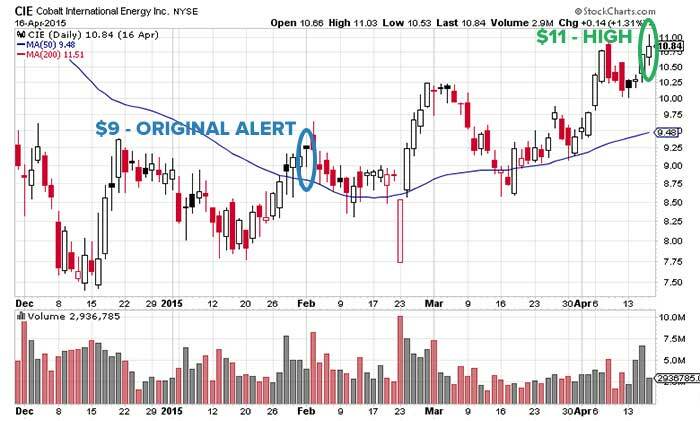 The first alert was for the airline sector as a whole and was actually a warning alert. The warning was that the airline industry was looking a bit over extended on Nov 4 around 10 am est, and as you can see, soon after the alert all the airlines experienced a pullback. While some chat rooms may have been yelling and screaming to “buy more”, we listened to the chart. GPRO was alerted on a Bull Flag Pattern on the 5 min chart on Nov 3 around 10 am est. 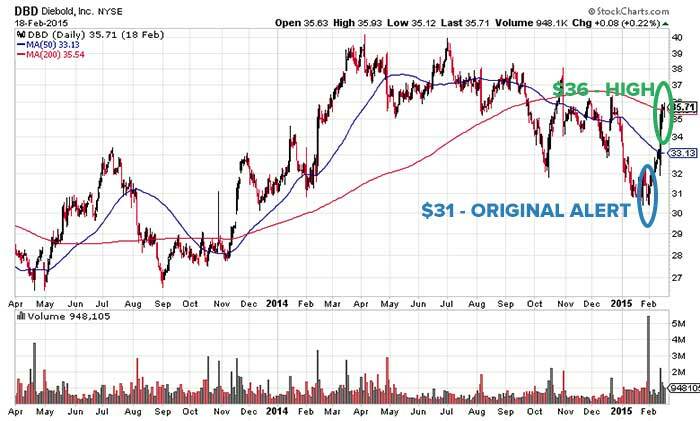 After breaking out from the technical pattern, the stock moved $3.35 per share to $83.35 in less than 15 minutes. $SODA came in as an alert stating that the stock had begun to move up but had not broken out yet. Based on this alerts I was able to turn a profit of just over $650. 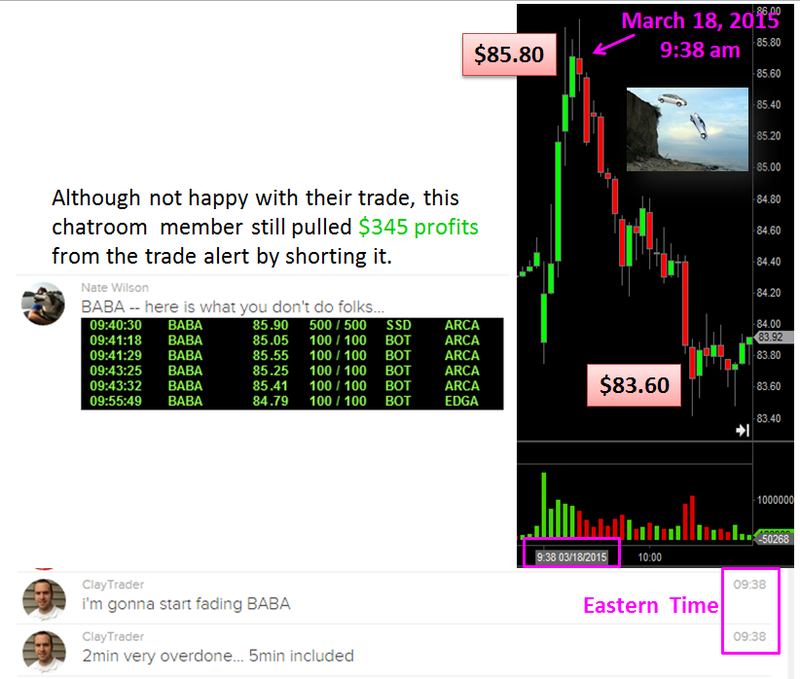 As you can see from the chart the alert came in at $22.60 and reached a high of $26.26 for a nice profit window of $3.66 per share. The final alert this week was actually for four stocks, all centered around pot, $ERBB, $HEMP, $MJNA, and $GRNH. The sector as a whole had a pretty huge rally and the alert was to avoid the potential “gap-and-trap” which eventually panned out in all four tickers. $TRN was actually alerted twice within the same day. First based on “massive dead body 2min” while trading at $33.75 and then crashing to a low of $31.22. Then again after a slight recovery suggesting a possible shorting swing trade based on news headlines. The second alert came in at $33.40 and eventually bottomed out at $30.64. This week saw two alerts for $NQ. The first of which came in on Oct 16 based on an increase in volume on the 5 minute chart. 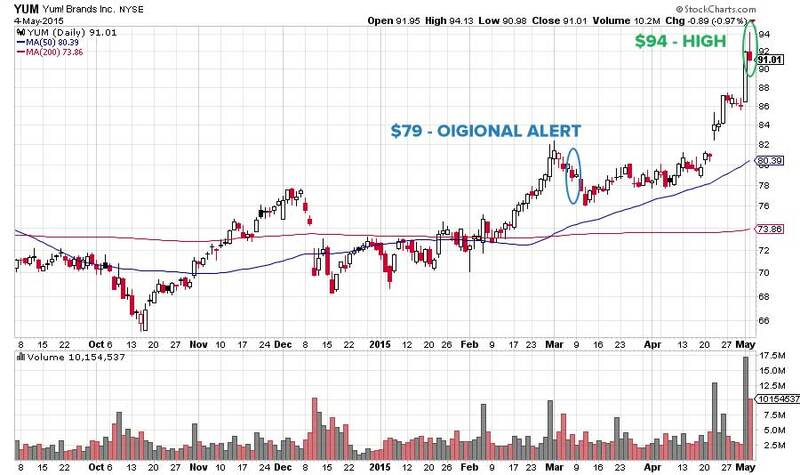 The stock was trading at $7.75 when the alert came in and hit a high of $9.10 within a few days. The second alert was one example of a warning we gave on NQ. The alert was blunt, but upfront and honest that the stock was most likely on its way down. We discussed NQ in a ClayTrader University live webinar while it was at $7.75, so I wanted to at least warn people that students were more than likely selling shares to lock in profits. NSEH was alerted while trading around $0.0020 for a potential short based on an expected press release. Within a short period of time NSEH bottomed out at $0.0011 for a potential opportunity window of 42%. NSPH, alerted on potential Ebola related news and then breaking through the 50 SMA on the 5 minute chart. 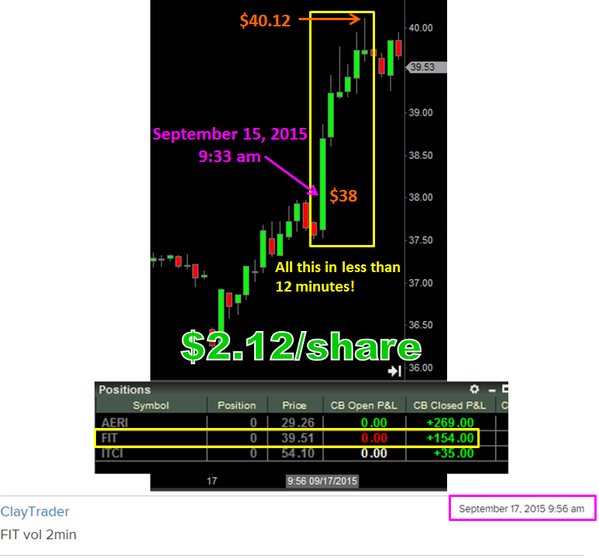 The alerts came in premarket and hit a high of $1.27 on the day, for a opportunity window of 69% from open. 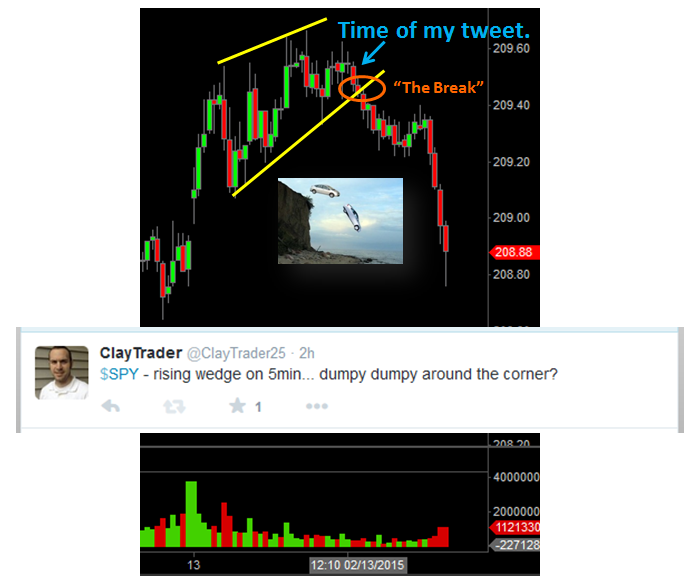 SPY was alerted based on a weak bearish break cautioning members about shorting the stock. Just after the warning was posted SPY had a night breakout to the positive side, crushing anyone we may have shorted into the bearish trend. 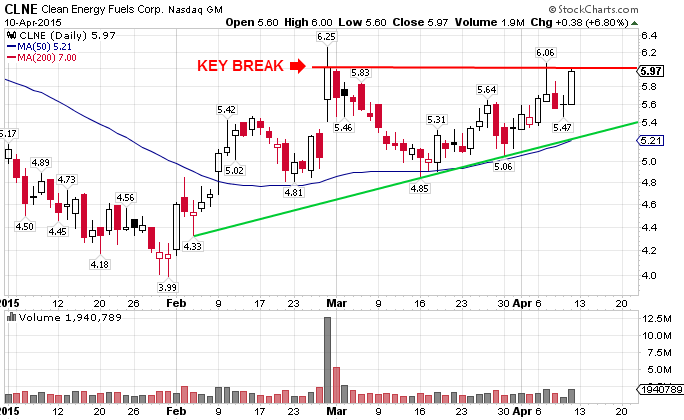 Alerted at 10:23 on Friday this week, APT had just broken through the key resistance at $4.45 on the 2 minute chart. Within the course of 24 hours APT hit a high of $6.86 for an opportunity window of 54%. Based on a twitter rumor and a huge volume spike IBIO was alerted while trading at $0.73. 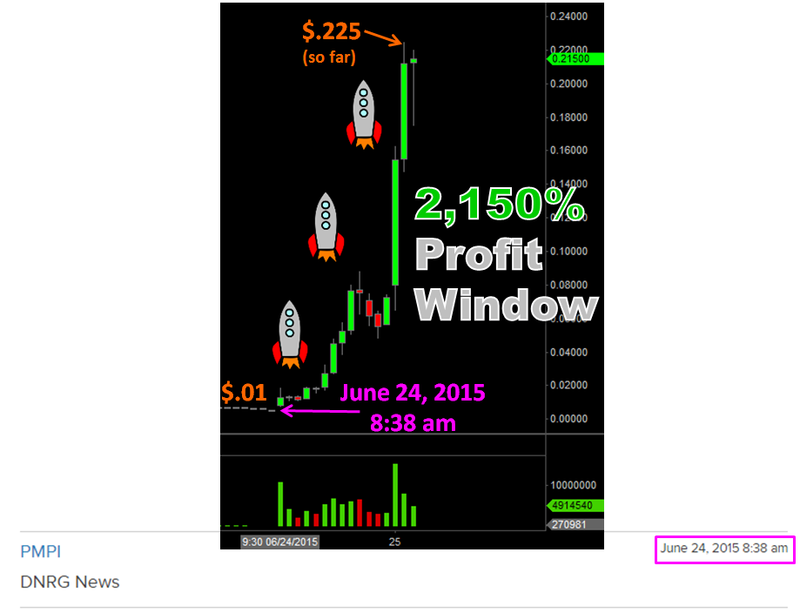 Within two days IBIO hit $2.70 for an opportunity window of 270%. After breaking through the $8.50 support level ARWR broke out to the downside for a quick 10 minute opportunity window of over $2 per share. GTAT started the day with a good liquidity and a high short percentage. After breaking through the key resistance of $0.96 GTAT had a 30 minute breakout of 54% to $1.49. After news broke about an order placed with DGLY from Mexico there was some good premarket movement and the stock opened at $15.27. 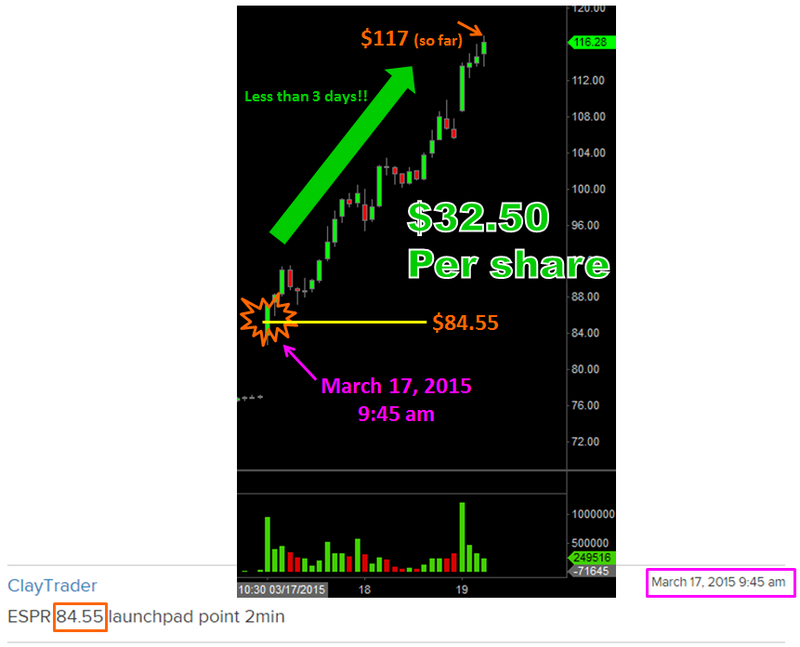 Within 30 minutes of open DGLY had rallied to a high of $17.38 for a $2.11 per share opportunity window. AEMD was alerted in last weeks Power Profit Scan Newsletter as something to keep an eye on based on a volatile day and large volume. After being alerted at $0.15 over the weekend AEMD was able to double within a couple days and hit $0.30. This weeks first alert came by way of an Inner Circle member and was for Lakeland Industries Inc. (LAKE). 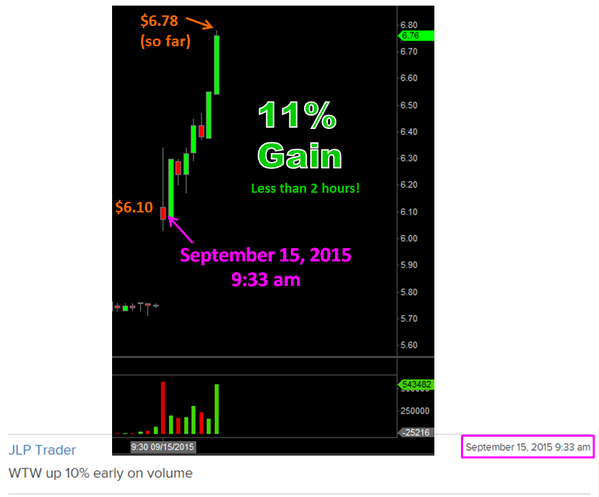 The alerts was based on the 2 min chart on Oct 1 trying to break through the $8.15 resistance. This week third alert was for Spherix Incorporated (SPEX). Alert came in a $1.20 based on the movement. The second alert was a quick mover with time from alert to the end of the move being just under an hour. Within that hour RADA Electronic Industries Ltd. (RADA) had a nice move creating an opportunity window of $.85 per share. The final alert was for Mind Solutions, Inc. (VOIS). The chart was alerted based on a volume increate at $0.0035 and created an opportunity windows of over 140% reaching highs above $0.0084. The first alert is a bit different than normal. Rather than alerting the room to a potential trade, this particular alert was made for a stock that definitely should not have been traded at that time. As you can see in the comments (along with the actual time they were made), Inner Circle members got a very blunt and honest warning. 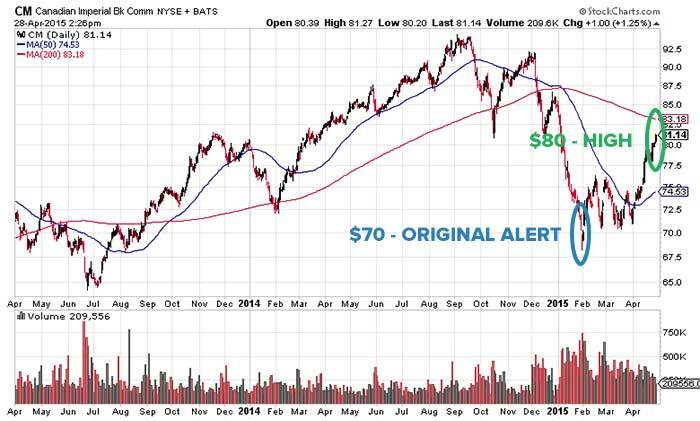 As predicted by the alert the stock had a horrific day as seen in the chart below. The final alert was for Himax Technologies, Inc. (HIMX) breaking through resistance on the 15 min chart. 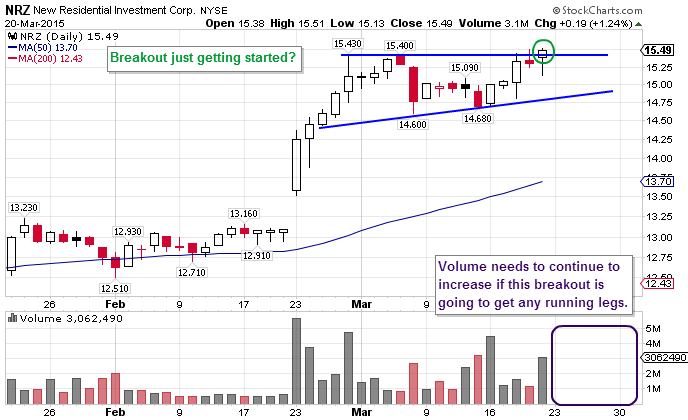 After breaking through the resistance the stock manage to gain over $1 from the time of alert. The first alert, Alkame Holdings, Inc. (ALKM), came via the Inner Circle power profit scan email. 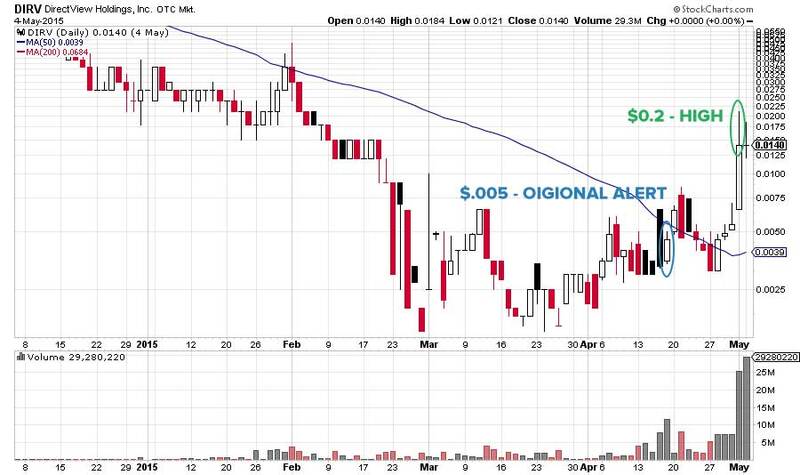 ALKM was alerted over the weekend and opened on Monday at $0.245, making a quick run over the first part of the week topping off at $0.40 for an opportunity window of 64%. ChinaNet Online Holdings, Inc. (CNET) was alerted based on a 5 minute chart while the stock was trading at $1.85 per share. Within a day the stock was up over 115% to a high of $3.98. Todays second alert came via a member in the Inner Circle chat room. Himax Technologies, Inc. (HIMX) was alerted based on a volume increase on the 2 minute chart on Sept 18, the alert came it at $8.80. By holding over night the stock reached a peak the following morning of $9.57, an increase of $.77 per share. The final alert, Sino-Global Shipping America, Ltd. (SINO), came in on September 15 based off of news about the stock. The alert it with the stock at $2.25. Overnight and through early morning trading the following day there was a large gap up hitting $4.65 per share. Our Final alert here today came in on Friday morning. Sprint Corporation (S) was alerted at $5.95. Within the span of about a day S set itself up as a classic trampoline trade opportunity, building an opportunity window of about 20% topping out at $7.15. Our fifth alert here today came in on Wednesday afternoon not long before close. RadioShack Corp. (RSH) was alerted at $0.90. Reading how things unfolded in the chat room still makes me laugh. It was a bizarre sequence, but an effective one nonetheless. With a continued run over the following morning RSH create an opportunity window of about 28% by reaching a high of $1.15. Net Element, Inc. (NETE) was also alerted by a member of the Inner Circle chat room based off of a volume surge on the 5 minute chart. The stock was trading at $2.70 when the alert came in. Over the next several days NETE create plenty of room for profit hitting $5.15 for a 91% window of opportunity. This weeks fourth winning alert came in Tuesday morning shortly after the bell. SinoCoking Coal and Coke Chemical Industries, Inc. (SCOK) was alerted based on 2 minute chart and an increased volume at $4.80. With strong support and increased volume SCOK high a high of $9.15 within just a few hours, almost doubling the value of the stock. The second alert came via the Power Profit Scan Newsletter over the weekend. WPCS International Incorporated (WPCS) opened on the Monday after the alert at $1.24. The chart had a several cent move first thing at open, but had a fairly slow day, however day two after the alert saw a huge rally with the chart hitting a high of $1.73. Universal Bioenergy Inc. (UBRG) was alerted on Wednesday (Sept 3, 2014) this week in the penny stock chat room based on news. The alert came in at noon at a price point of approximately $0.0014. After this chat room alert, the stock hit a high of of $0.0032, but to play things on the conservative side, let’s just base the calculations off of hitting $0.0027 at one point. 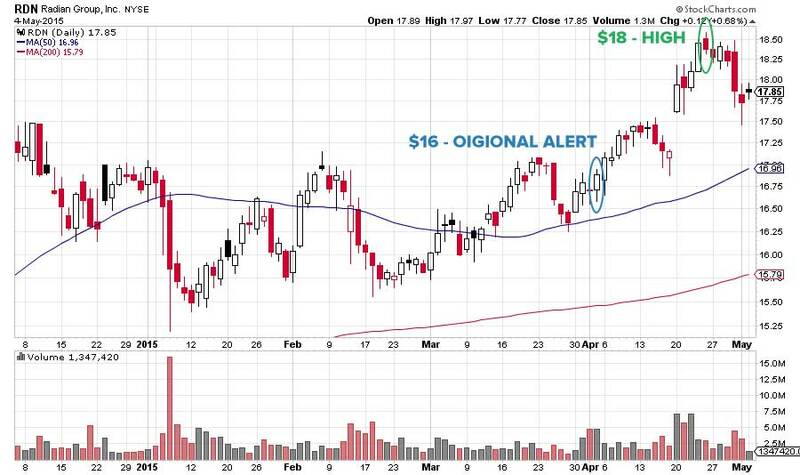 Even with these conservative numbers, the alert still had an opportunity trade window of 93%! Bummer… it didn’t hit 100%… haha. Image Sensing Systems, Inc. (ISNS) was alerted on Tuesday (Sept 2, 2014) this week. The alert came in just before noon at a price point of approximately $4.75. 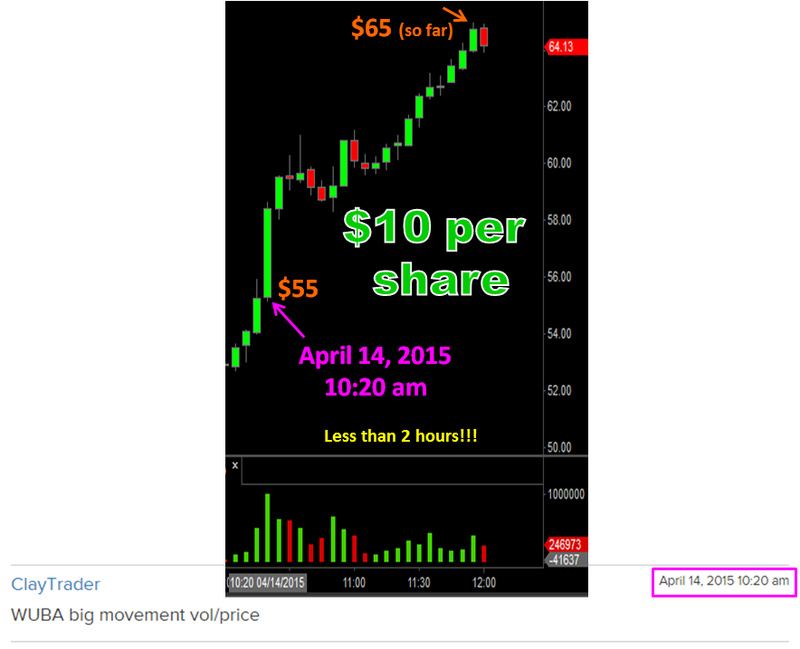 The stock then went on to create an opportunity trade window of 109%! Even if you just caught 1/10th of the run, that is still over 10% on a very liquid stock. Not bad at all. The first alert, Vision Industries, Corp. (VIIC), was actually alerted several weeks ago but continues on a tear, being alerted at $0.007 on August 28. Over the past two weeks the stock has created an opportunity window of over 500%. Leaving plenty of room to get in and still take a profit. RadioShack Corp. (RSH) was alerted on Tuesday (8.26.14) this week. The alert came in just after noon at a price point of $0.71. Within three days the stock was at a high of $1.77 per share for a gain of 149%! The second alert highlighted is Digital Ally Inc. (DGLY), alerted at 3:38 pm est. on the afternoon of August 19 at a price of $5.60 per share. 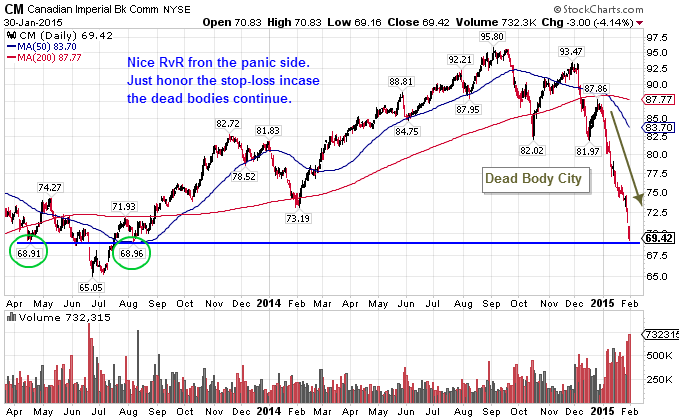 Over the time span of about a day the stock rose 57% to $8.83, yielding a potential gain of $3.23 per share. International Consolidated Companies, Inc. (INCC) Was actually alerted last week on August 19th at a price point of 0.009. A little bit of a slow mover INCC hit a high of 0.0215 earlier this week for a gain of 138%. The final alert I am going to highlight is Vringo, Inc., the alert came at 12:42 on August 18th at a share price of $0.95. At its peak Vringo, Inc. hit a high of $1.46 per share for a 53% gain. The alert for Mandalay Digital Group, Inc. came via the Inner Circle Power Profit Scan Newsletter on Saturday, August 15. At the time of the alert the price per share was $3.41. Over the course of the week the price rose $2.54 per share to a weekly high of $5.95. The final alert was for a big board stock, USEC Inc. (USU), the chart was alerted based on a volume increase and trend movement. 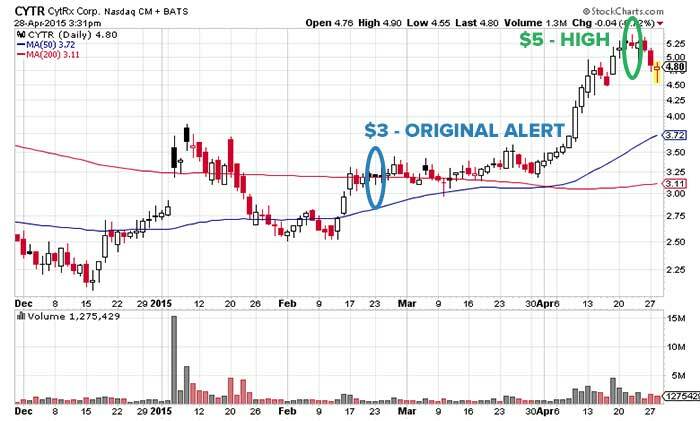 The chart was alerted at $4.90 with a high of $7.13 for a $2.23 per share gain. Keep in mind, this movement all occurred in a span of less than 1 hour! 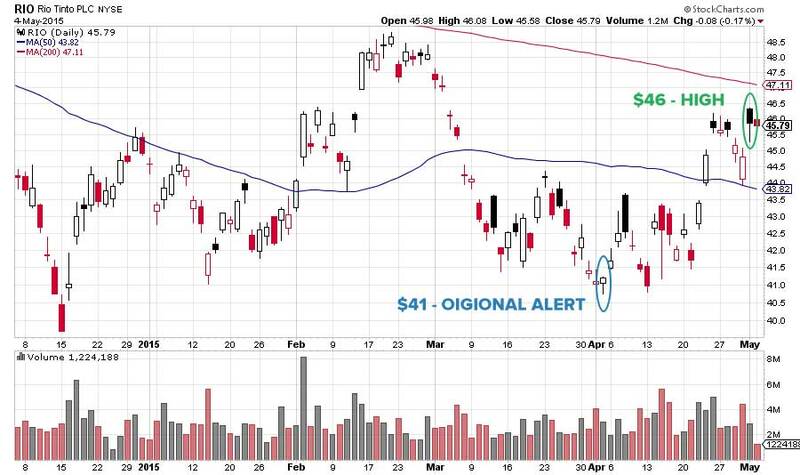 The third alert for this past week was from another member of the trading group. 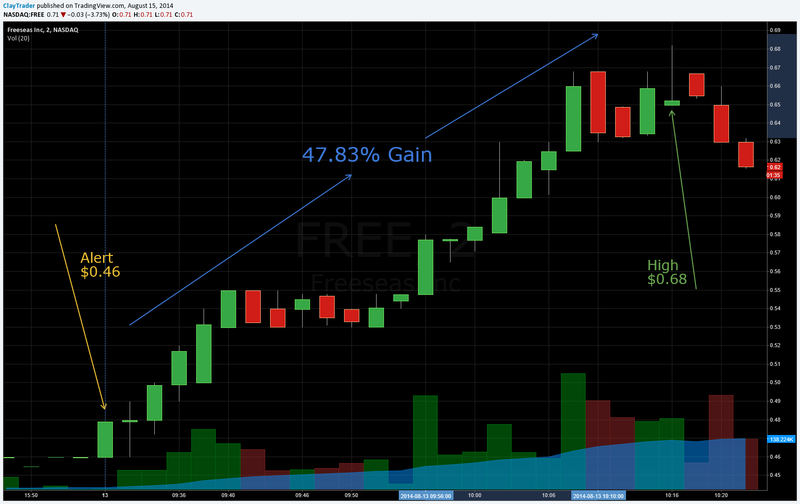 It was for FREE (FreeSeas Inc.) and was another long alert based on the charts technical analysis and a broken resistance. 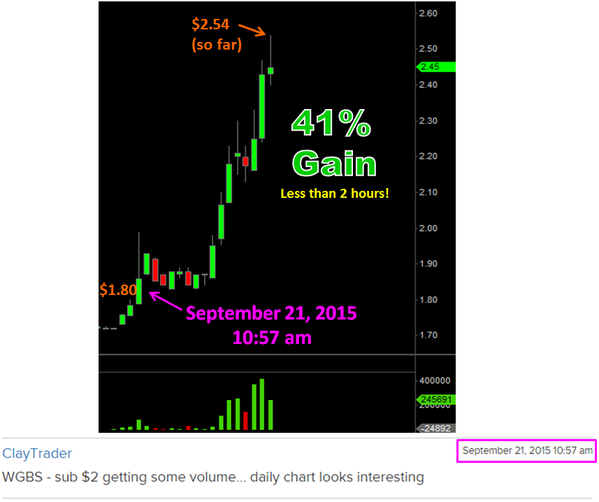 As you can see in the chart blow the alert went out at $0.46 with a quick gain on the stock of 47.83% to $0.68. 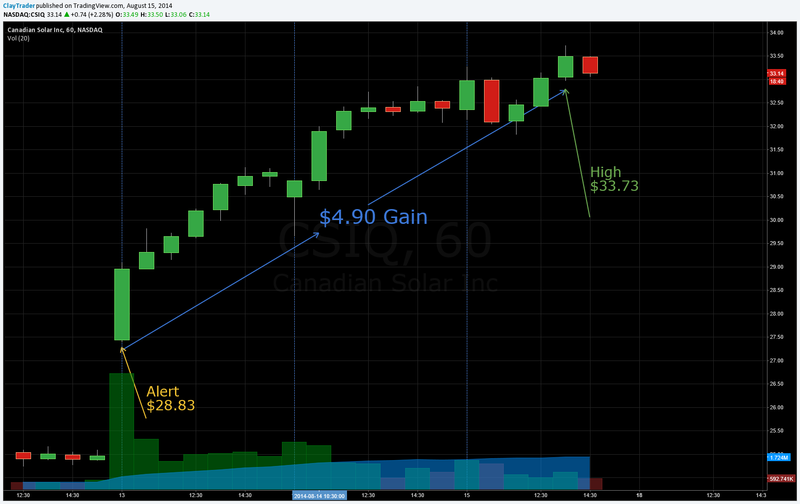 The second chat room alert came at 10:12am for the Canadian Solar Inc. (CSIQ). 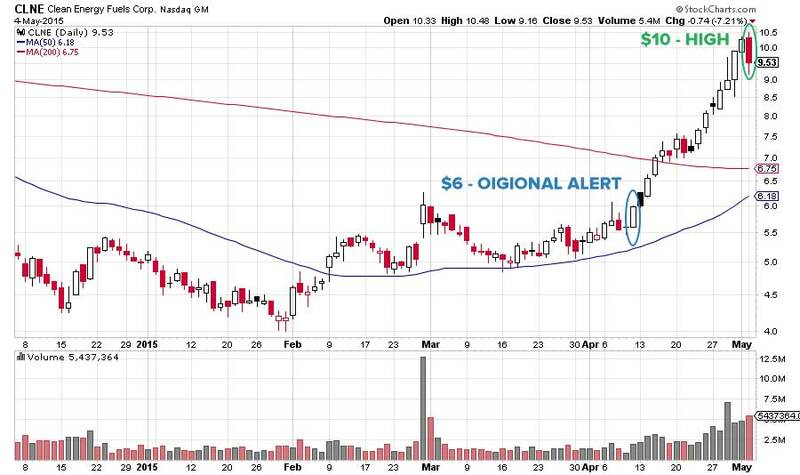 The alert was based on the 2-min chart pattern with strong volume to support. When the alert came in the stock was trading around $28.83. With in just over 2 hours the stock was up over $2 to $31.14. As you can see from the chart below there was pretty steady growth from the time of alert to where it was currently trading on Friday. The first chat room alert was on the short side and came it at 12:47 pm for SeaWorld Entertainment, Inc. (SEAS) when the stock was trading around $19 per share. With in 1 hour the stock hit a low of $18.17 for a quick score of just under $1 per share.